It’s hard finding a reliable car scratch remover. You know, one that actually removes deeper scratches, paint blemishes, and scuff from your vehicle. It’s easy to find a scratch remover that excels at one job. However, finding a product that prevents multiple anomalies, such as fading, scratches, and returning your car to a like-new state, well that’s nearly impossible. Surprisingly, that wasn’t impossible for us. For you, our loyal readers, we’ve collected a list of the best scratch removers of 2019. We’ve spent a considerable amount of time testing some of the best auto scratch repair kits currently on the market. Our goal was to find the best products for removing car scratches and prevent fading.We searched for the perfect all-in-1 product that works on multiple surfaces and devices. By reading this article, I guarantee you that you, in turn, will find the best auto scratches repair kit for yourself or your business. Before we begin, let’s take a quick look at our best car scratch removers. We started off our article by composing a comparison table of our favorite paint restorers and blemish correctors. If you’re looking to buy a good product for restoring your car’s clear coat, this list should have exactly what you’re looking for. Without further ado, let’s jump on into our comparison of our list of the top 12 car scratch removers of 2019 and their manufacturers. As you can see, not every product comes with additional accessories, such as polishing pads, sanding paper, or extra compounds. That’s ok because also took the time to compare our products based on rather or not they restored paint and removed (not filled) deeper scratches. These factors helped us consider the scratch remover’s overall performance and how valuable they were. Overall, we looked for the best formulas for restoring and preserving your car’s clear coat. The NOVUS 2 Plastic Fine Scratch Remover is a handy little product that’s guaranteed to work on any type of plastic. Instead of simply filling in deep scratches and gouges, it works to remove them completely. This leaves a nice, smooth finish that looks great wherever you go. It’s guaranteed to work on cars, auto headlights, motorcycles, CDs, DVDs, Blue Ray Disks, windshields, and boats. That’s a long list of eligible materials. It also prevents and restores the dulling and fading of various surfaces, including glass table tops and polished woods. Using the NOVUS 2 Plastic Fine Scratch Remover is a fairly simple process. The deeper the scratch or gouge, the more pressure is needed while applying the scratch remover. Always shake the bottle before applying it. Also, make sure the surface area is clean before removing the scratches. You may want to use a damp cloth or purchase the NOVUS 1 pre-cleaner. While removing scratches, you’ll want to use a clean, soft cloth and go over the surface area in circular motions. Let the remover dry in a soft haze. For deep scratches, you’ll want to use multiple applications of NOVUS 2. I would not recommend using the NOVUS 2 Plastic Fine Scratch Remover on your phone cover or sunglasses. It’s an extremely potent chemical that’s better for more heavy duty usage. It might be too strong for your phone cover. NOVUS 2 Plastic Fine Scratch Remover is an inexpensive, yet reliable product. It’s designed and guaranteed to, not fill, but remove deep scratches. It works quickly and does a great job at preventing and restoring dulled or faded surfaces. It’s a great product with a number of different uses. Barrett Jackson Scratch Remover uses an advanced formula to buff scratches and gouges out of the surface of your car. It’s guaranteed to leave your vehicle scuff-free and polished. It leaves a wet, waxy clear coat of polish on your automobile’s surface. This leaves it looking like it’s received a fresh coat of paint. It provides a quick and simple cleanup with no left over residue and powder. It’s safe to use on any finished products for a clean, wet-look finish. The Barrett Jackson Scratch Remover is best for removing minor scratches and swirl marks on the surface of your car. Before using this product, you’ll want to make sure that the surface is clean and ready to be buffed. You can do this by wiping it with a damp cloth or cleaning it with a specific compound. Next, you’ll want to dampen a buffer pad with the scratch remove. Go over the surface area in slow circular patterns for the best results. Finish by letting the scratch remover air dry. The downside to the Barrett Jackson Scratch Remover is that it’s a fairly weak product. It’s meant for repairing small or shallow surface scratches. While it does leave your car with a waxy clear coat, it doesn’t help to prevent further scratching or dulling. The Barrett Jackson Scratch Remover is the perfect product for minor touchups, buffing out blemishes, and blending. It may not be the most powerful formula, but it’s one that does its job well. There’s no chance of further damaging the surface of your car with the Barrett Jackson Scratch Remover. I recommend you take a chance and check it out. Mothers 08408 Scratch Remover is designed to deal with more surface scratches then deep gouges. It’s meant for touchups, blemish control, and blending. It’s generally recommended that you use this scratch remover in areas around your car’s trunk and door handle. This is where regular wear and tear build-up tends to occur on the car’s paint surface. It provides long lasting care and is guaranteed to work on any paint job. It’s especially effective on dark vehicles, such as black cars. This scratch remover can restore any paint while preventing further fading. Mothers 08408 Scratch Remover should be used on a clean surface. You’ll want to wash off the specific surface area beforehand. Then take a soft cloth, apply the scratch remover, and go over the surface area in small circles or short long streaks. You’ll want to apply this scratch remover multiple times for the best results. To prevent fading or dulling of the car’s clear coat, you’ll want to regularly apply the remover every few weeks. Let the scratch remover air dry when finished. This will guarantee a wet, waxy finish. Because Mothers 08408 Scratch Remover is only meant for touchups and blemish controls, it can’t handle deep gouges. It’s unfortunately not the best car scratch remover for full top coat maintenance. Another downside to this product is that it’s limited to vehicles and boats. It might not be the best option for cleaning other items such as glasses, phone covers, glass table tops, etc. Mothers 08408 Scratch Remover is an affordable product that can fix any paint job. It can work on any surface area or vehicle, including a truck, SUV, motorcycle, and boat. Sold in 8 oz. bottles, you should have more than enough to last you months. Honestly, it’s no surprise that a Turtle Wax product has made it onto our list. They’re one of the top manufacturers of car maintenance products currently on the market. Turtle Wax Color Magic Car Polish utilizes a blend of polishes, pigment controls, and dyes for the scratch remover formula. While it doesn’t actually remove the scratches, it instead fills them for a clean, waxy finish. It also restores and rejuvenates the car’s paint and top coat for a like-new appearance. Its black technology is perfect for black tinted cars. This is because it actually enhances the paint’s reflective properties while filling in the deep gouges. Finally, this car polish helps to prevent further fading and dulling. It’s definitely an all-in-1 product. First, makes sure that you shake the bottle before using. Then clean the surface area of the car. You’ll need a damp cloth. Apply the car polish to the cloth and then spread evenly onto the surface, one section at a time. You’ll want to let the polish dry in a soft haze. Finish by wiping off the excess polish with a clean edge of the cloth. Because the Turtle Wax Color Magic Car Polish doesn’t actually buff out the scratches, it may require extra work. Since the scratch is still there, the polish may need to be regularly reapplied to prevent the polish from fading or dulling. This is simply to guarantee that the polish doesn’t fade to the point that the scratch is noticeable again. Turtle Wax Color Magic Car Polish does a miraculous job at removing grime and ingrained dirt out of your car’s coat. It’s perfect for filling up deep gouges without causing more damage or wear. This car polish is a great product that’s guaranteed to provide long lasting shine and protection. The 3M- 03900 Rubbing Compound uses an impressive fast-cutting formula to not fill, but remove scratches. Actually, it doesn’t only remove scratches but also oxidation stains and blemishes. It finishes by polishing your car’s surface, leaving it waxy, shiny, and scuff-free. This scratch remover is a high-class product that’s perfect for any car or machine. It’s a versatile compound that can leave a black car in a lustrous like-new state. It can easily remove grade 1200 scratches or anything of a finder coarse. It also works on stubborn water spots for a fine finish. First, you’ll want to clean the top coat of your car. Use a damp cloth or wet rag. If your paint is in good condition, you can immediately start with the 3M- rubbing compound. Then finish with a top coat of wax. If not, then I recommend using an additional swirl remover beforehand. To use the 3M- rubbing compound, start with a 500 grit sanding pad. Apply a few drops of the rubbing compound to the pad and work your way up from 500 to 1000 to 1200. Finish with an ultrafine buff 1500 and let the car’s surface air dry. Unfortunately, the 3M- 03900 Rubbing Compound is not that effective on deep scratches and gouges. If you decide to try, you may need to use multiple applications of the formula. However, the sanding pads should help considerably. The 3M- 03900 Rubbing Compound is asimple product that will leave your car looking smooth and clean. One 8 oz. bottle can last years of use and guarantee that your car stays in like-new condition. What’s even better about this scratch remover is that it’s incredibly affordable. So, if you do run out, don’t worry about having to pay an arm and a leg for a new one. Meguiar's M105 Mirror Glaze utilizes a super micro abrasive technology to buff away deep scratches and blemishes. It’s guaranteed to remove abrasions that require a 1200 or less grit, thus leaving a smooth, fine finish. It can also be used to defend against swirl marks, water marks, oxidation stains, and more. This scratch remover was designed to be used by hand, with a rotary buff, or with a DA polisher. It’s a handy product that’s clear coat safe and will leave holograms on your car’s surface. the Meguiar's M105 Mirror Glaze is a fairly simple product to use. First, you’ll need to start with a clean surface. Of course, this means wiping away the loose grime and dirt with a damp cloth. Then you’ll want to start with a 500 grit sanding pad to buff out the scratches. Dampen the sanding pad with a few drops of the scratch remover. Move on to a 1000 and 1200 sanding pad. Finish with an ultrafine 1500 grit and let the compound air dry. Meguiar's M105 Mirror Glaze’s one fault is that it takes almost half the bottle to achieve that super reflective appearance. It works fairly quickly to remove scratches. However, if you want that polished, hologram look, you’ll have to almost pour the entire bottle on the car. The Meguiar's M105 Mirror Glaze will leave your car with holograms and a smooth reflecting surface. It’s a great option for a long lasting, simple scratch remover. Its micro abrasive technology does a wonderful job at buffing off even the most stubborn scratches. Removes water marks, oxidation stains, etc. 3M- 39087’s all-inclusive Scuff Repair Kit comes with a wide range of handy accessories. It comes with the unique rubbing compound which is good for light scratches and blemishes. There’s a super fine 3000 grit pad for removing small scratches without further damaging the car’s clear coat. It also comes with an aluminum oxide abrasive pad for quickly, but gently removing scuff marks. The scratch remover compound is guaranteed to leave your car smooth with a clean, reflective surface. All of these come in the 3M- repair kit. First, you’ll want to use the 3000 grit pad to remove the scratches on the surface of your car. You might need to apply extra pressure as the 3000 grit pad is extremely fine. Go over the scratches in a circular rotation, with or without water. Then blend in the surface area using the aluminum oxide abrasive pads until it’s matted. These work faster and don’t need a ton of pressure. They’ll work to blend in the remaining scratches and blemishes. After this, use a clean cloth to apply the rubbing compound and scratch remover. Wipe off the additional compounds and let the surface air dry. 3M- 39087 Scuff Repair Kit doesn’t work on deep scratches or gouges. It also doesn’t work well on discolored paint. You may want to purchase a coarser grit sandpaper for fixing areas with discolored paint. The 3M- 39087 Scuff Repair Kit is an all-in-1 package that will save you both time and money. Its 3000 grit pad is a truly impressive accessory that will remove any and all scratches and blemishes from your car. It will even protect your car from future fading and dull. This is a product that’s worth every cent. The Turtle Wax T241A Polishing Compound works best on light scratches, oxidized surfaces, and stubborn stains. It’s safe for any type of automobile, boat, SUV, truck, and motorcycle. It works best on painted metal or chrome. This formula is guaranteed to restore the gloss and shine on your car, restoring it to a like-new state. It even helps to prevent further dulling and fading, promising long-lasting results. It’s a very versatile product that’s great for anyone and any job. You’ll want to clean and dry your car before using the Turtle Wax T241A polishing compound. Make sure that you apply it on a cool surface and not in direct sunlight. Next, you’ll apply the material on a clean rag and rub it into the surface area in a clockwise fashion. Remove the excess amount with a clean rag, and then let the compound air dry. Once the surface area is dry, you’ll want to buff the top coat with another clean rag. The Turtle Wax T241A Polishing Compound doesn’t actually remove scratches but instead fills it in. This means that it may require a regular application to keep the compound from wearing away and making the scratch visible again. Of course, this may only be a monthly or bi-monthly thing. You can always consider using sandpaper with the polishing compound. The Turtle Wax T241A Polishing Compound is a great option for anyone trying to fix up their vehicle. While it doesn’t actually remove the scratch, it does a great job of filling it in. Not only filling it in, it also polishes and waxes your car until it offers a brilliant shine. The Turtle Wax T234KT Repair kit is an all-in-1 solution for even the worst car scratches. It comes with a clear coat pen that fills in both small and long scratches through its quick-drying clear coat formula. Its high-quality color coded polishing pads help to restore even the most faded surface areas. Each pad features a different grit for enhanced detail and better results. It also comes with a spray lubricant and paint clarifying compound for blending in the fresh top coat. This repair kit works quickly and effectively to provide your car a long lasting shine. Before using the Turtle Wax T234KT Repair Kit, you’ll want to wash and dry the surface of your car. When it’s clean, use the polishing pads to soften the scratched area. Then apply the clear coat pen. Shake the pen before using it. After this, you’ll apply the spray lubricant and paint clarifying compound. Blend them into the clear coat for 1 minute. Then wipe away the remaining compound with a clean rag. Let the surface dry, and then use the polishing pads to even out the top coat. The downside to the Turtle Wax T234KT Repair kit is that it requires multiple, regular applications. This is, of course, because it fills in the scratches instead of buffing it away. You may want to consider investing in a coarser grit sanding pad to remove the scratch. The Turtle Wax T234KT Repair Kit can easily save you money and time while removing unsightly scratches and blemishes. Remember that this product is best for light scratches and blemishes. So, it might not work as well on deep gouges and scratches. However, it’s an affordable product that’s definitely worth a second look. 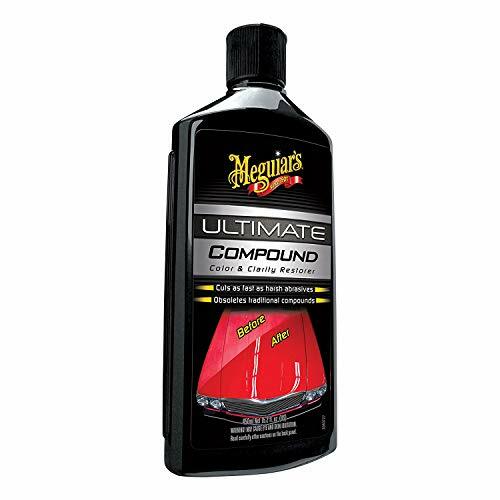 The Meguiar's G17216 Compound is an extremely potent formula that’s great for all surface scratches, blemishes, and oxidation marks. It can also quickly get rid of water stains and harsh abrasions without causing more damage. Its micro abrasion technology guarantees like-new results for even the most worn and faded of automobiles. It can even be used by hand or with a DA polisher. This compound can clean and fix below the surface defects, such as swirls. It will leave it glossy and shiny as if your car had just been waxed. First, make sure that the surface area is clean and dry. You can use a damp cloth to do this. Next, you’ll want to apply the Meguiar's G17216 to either a cotton towel or a foam pad. In a circular fashion, apply the compound to the car’s surface. You’ll need to make at least 4 passes over the surface area. Then clean off the residue with another clean towel or pad. You’ll want to repeat this process until the scratch is gone. Finish up by waxing the car’s surface for a nice, shiny finish. The Meguiar's G17216 Compound would top our list if it actually removed the scratch. Instead of buffing it out, it simply filled it up. After a while, the scratch may return (depending on how deep it is) whiter than ever. Meguiar's G17216 Compound is an extremely impressive formula that can wipe out even the deepest of car scratches. What makes it even better is that it’s extremely affordable. If you’re looking to return an old, junked car to like-new status, this might be your best option. The 3M- 39071Scratch Removal System uses a 3-step process to remove light scratches, blemishes, and water stains. It comes with a super fine 3000 grit sanding paper for buffing out scratches. The 3M- scratch remover compound and polishing pad do an impressive job at leaving the car’s surface smooth and shiny. It also adds a thin layer of protection against fading, dulling, and further marking.Its 3M- rubbing compound is used to refine the blemished or scratched surface. It’s a great package that can be used on any vehicle including a truck, an SUV, and a boat. First, you’ll want to start by cleaning the surface area. You can use a damp cloth or towel for this part. Next, simply use the 3000 grip sanding paper to buff out the scratches. Next, you’ll add the 3M- rubbing compound. Simply rub it into the scratched area in a circular fashion. You’ll do the same with the scratch remover. Once the scratch has vanished, remove the excess with a clean cloth and let it dry. When it’s dry, you’ll finish up with the polishing pad. The 3M- 39071 Scratch Removal System is fairly useless against deep scratches, gouges, and oxidation marks. It’ made for light scratches and it does its job well. However, if you need a powerful compound for removing scratches, you might need to look elsewhere. The 3M- 39071 Scratch Removal System does a good job at removing frustrating scratches caused by keys and tree branches. It’s a simple to use, affordable product that’s best for touchups on your car. If you’re looking for a scratch remover like this, then you might want to take a closer look. The Meguiar's G10307 ScratchX 2.0 is a powerful compound that’s almost as potent as the Meguiar’sG17216. It uses micro abrasion technology to remove fine scratches, blemishes, and oxidation marks along your car’s exterior. Of course, it can do this without causing further damage or blemishes. It’s usable both by hand and with a DA polisher, which allows for better results. It can also help to reduce swirls on your car’s surface while preventing fading and dulling of the top coat. It’s a great product for returning your car to a like-new state. First, make sure that the surface area is clean and dry. You can use a damp cloth to do this. Next, you’ll simply applyMeguiar's G10307 ScratchX 2.0 to either a cotton towel or a foam pad. In a circular fashion, rub the compound on the surface of the car. Make sure that you make at least 4 passes over the affected area. Then clean off the residue with another clean towel. Repeat this process until the scratch is gone. The Meguiar's G10307 ScratchX 2.0 is not the best option for deep scratches. It may also require a regular application to keep up your car’s like-new appearance. This can easily become a bit of a hassle. While the Meguiar's G10307 ScratchX 2.0 may not be as potent as the G17216, it still does a great job at filling in scratches. It’s an extremely handy product that’s guaranteed to last for a long time. What is a Car Scratch Remover Kit? Car scratch remover kits are simply all-in-1 products that come with additional accessories for the best results. These accessories may include sanding paper, a polishing pad, rubbing compound, scratch remover, or more. They’re usually meant for touchups and light, surface scratches. What are the common features in a car scratch remover kit? An abrasive: an abrasive material is typically gritty and rough, such as a sanding pad. They’re meant to buff away the scratch or blemish until it’s smooth and level. A polisher: a polisher is meant to blend the treated area until it’s shiny and matches the rest of the car’s clear coat. It can be used with the abrasive material or anything else. Do I Need Any Special Tools? Not necessarily. Many individuals use scratch removers by hand while others use a DA polisher. It’s no lie that a drill or DA polisher will provide you better results. However, not everyone has those. You can also spray bottles and microfiber pads for a shinier, cleaner finish. Does car wax remove scratches? Sorry to tell you this, but no. Wax acts as a buffer, sealer, and protector against further dulling, water marks, and scratches. However, it doesn’t help to remove pre-made scratches and blemishes. You’ll want to invest on a scratch remover to remove those scratches. Not to mention, a rubbing compound to blend it and a polisher shines it up. Finish with the wax to protect against further damage. These are chemical based scratch removers that focus on filling in the scratches until they’re level and hidden. Many compounds are sold in a color-coded formula. This way, you can match the compound to your car’s paint so that it will blend in better. It always helps to wax, polish, and buff this surface area once it’s been filled in. This will guarantee that it’s smooth and blended. These use a tough, gritty textured paper or polish to grind down the surface and edges of your scratch until it’s level. You can even purchase compounds that come with a micro gritty texture for buffing away the scratch. Usually, abrasive scratch removers are sold in a kit form. These kits may include a polish pad, sanding paper, and rubbing compounds. Abrasives are typically cheaper, but they can cause the most damage to a car’s clear coat. Now that you have a firm understanding of car scratch removers, which formula are you considering purchasing? Are you looking to perform a simple touch-up or do you have a deep gouge to fill? Do you want to buff it out or fill it up? Our list has every option for any decision you decide to make. And if you don’t like what you choose, don’t worry. All our choices are extremely affordable and are risk and damage-free. If you do purchase one of our top picks, I encourage you to review and tell us how it worked. Did it perform as expected? Is your car scuff-free? What did you use it on? Which product do you think is the best car scratch remover of 2019?